Once Booming, Mongolia's Economy Veers From Riches To Rags : Parallels The sparsely populated nation of nomadic herders rode China's booming economy by supplying it with coal. But as China's economy slows and commodity prices drop, Mongolia's economy is crashing. 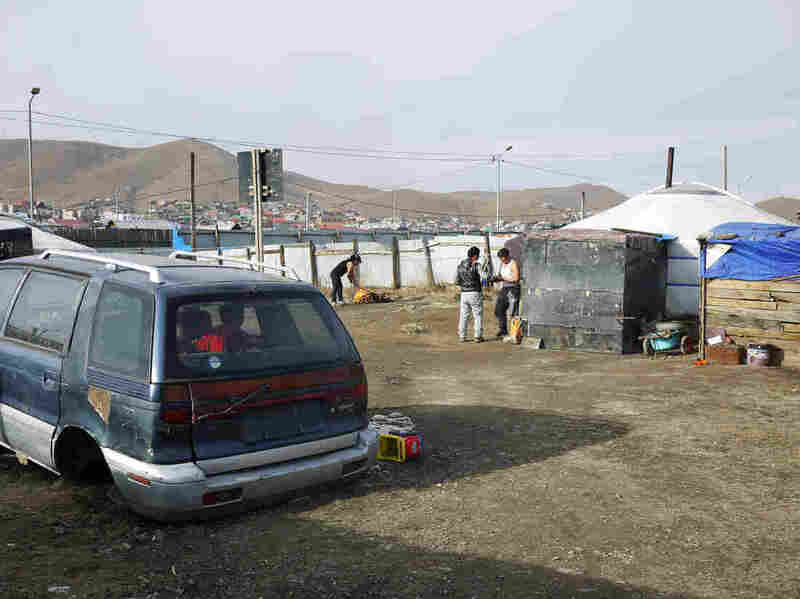 A scrapped automobile serves as a playground for the children of Gankhuyag, a former herder who lives in a ger or tent on the outskirts of Ulaanbaatar, the capital. The family moved here a few years ago when Gankhuyag started work as a porter. Inside Mongolia's largest open-air market in the capital city of Ulaanbaatar, it doesn't feel like the economy is on the brink of collapse. Alleyways are packed with people selling carpets, fabric, clothes and nearly anything else you could think of. But vendors here have had a front-row seat to an economy that has quickly gone from the world's fastest growing to one of the slowest. Everyone here seems to have a riches-to-rags story. "Business is terrible," says candy seller Erdenejargal. "More and more people are unemployed and they can't afford anything. They ask me about the prices. I tell them. They leave." For 28 years, Erdenejargal — who, like many Mongolians, goes by a single name — worked for a construction company. Last year, her company, like many involved with building infrastructure, went bankrupt. And now she's here in the market selling Russian candy out of the trunk of her tiny, rusted-out car. (Left) A Mongolian national flag flies near a Genghis Khan statue – the world's largest equestrian statue – in Tsonjin Boldog, Mongolia, on July 16. (Right) Chocolates are displayed for visitors to Mongolia's Government Palace in Ulaanbaatar. She's perched in front of a loudspeaker dangling from a storefront announcing chickens for sale — chickens she can't afford. "The police chase me out of here, but if I don't do this, we won't have any money," Erdenejargal says with a sigh. "I've got three children and my husband lost his job. This is the government's fault – they borrowed so much, and it all disappeared." Mongolia, sandwiched between Siberia to the north and China to the south, is twice the size of Texas with just 3 million people. It's a nation of nomadic herders whose history goes back to Genghis Khan. China's demand for coal helped Mongolia's economy grow by 17.5 percent in 2011. This year, the World Bank forecasts it will grow by less than 1 percent. "We're considered to be the fastest growing economy in the world for a number of years, since 2011 and 2012," says Undraa Agvaanluvsan, who was elected to the country's parliament in June. "When commodity prices started going down, so did our economy." 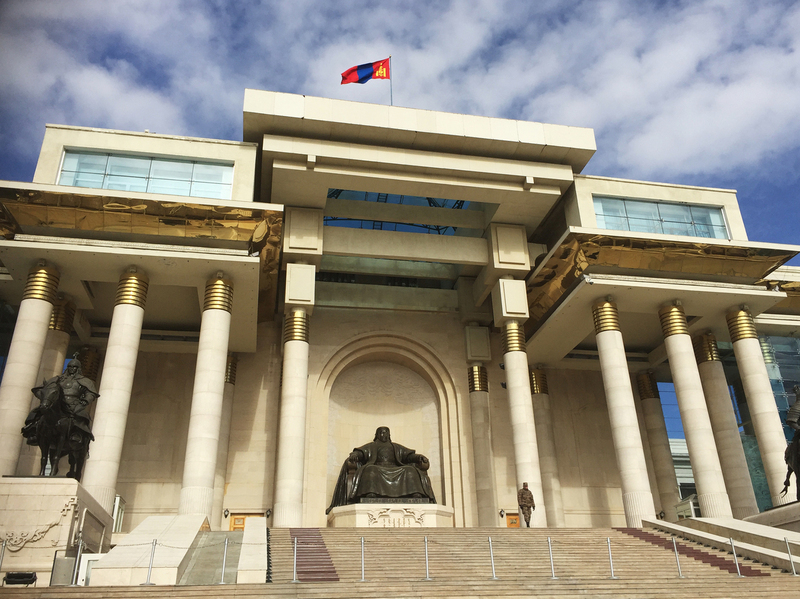 A statue of Genghis Khan sits atop the stairs of the Government Palace in Ulaanbaatar, Mongolia's capital. The country's economy has slowed down since the drop in gold and mineral prices. Now Mongolia — nicknamed "Minegolia" for its vast mineral wealth — suffers as global prices for coal and copper plummet. Its mines are bleeding money. When its economy was booming five years ago, the Mongolian government went on a spending spree, issuing $1.5 billion worth of so-called "Genghis bonds" to build infrastructure. Much of the money was poorly spent. Several officials were revealed in the Panama Papers for holding secret offshore accounts. Now Mongolia's debt is nearly 80 percent of its GDP. Its currency, the tugrik, is in a free-fall. "Obviously, the immediate thing we can do is fix our budget. Cut our deficit as much as we can," says Mogi Bontoi, who runs the market intelligence firm Cover Mongolia. (Left) Mogi Bontoi runs the market intelligence firm Cover Mongolia. He says the country is likely to default on billions of dollars' worth of loans. (Right) Undraa Agvaanluvsan, elected to Mongolia's parliament in June, vows to help Mongolia climb out of its massive debt problem. He says an IMF emergency bailout won't be enough to prevent Mongolia from defaulting on billions of dollars worth of loans. Some of that debt is owed to its neighbor, China — whose economic and political influence many Mongolians fear, but seems poised to loan even more money to Mongolia. "Despite our public fear of China, what our politicians do is go to China," Bontoi says with a chuckle. In the meantime, he says, unofficial unemployment hovers between 30 and 40 percent. Many of those who have lost their jobs live in neighborhoods on the outskirts of the capital, filled with gers, the round tents of nomads who moved to the city to find work back when the economy was healthy. 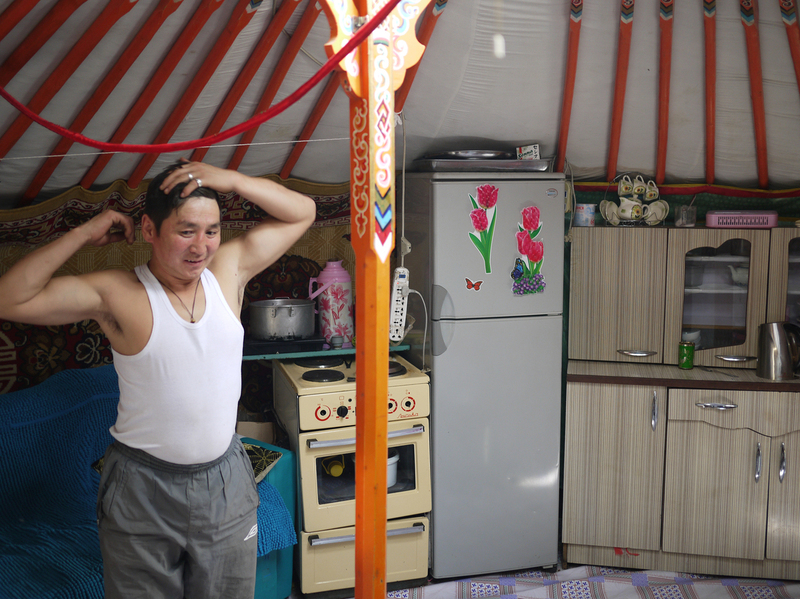 Gankhuyag, a former nomadic herder who now works in Ulaanbaatar as a porter, stands inside his ger on the outskirts of town. Gankhuyag, 38, abandoned his life as a nomadic herder and moved here a few years ago with his family to work as a porter. "Everything costs money in the city – water, electricity, gas," he says. "I'm thinking of returning to the grasslands. Life is much simpler there. You ride your horse, herd your animals and sell their meat and hides." For some in this sparsely populated country with a grassy backyard whose horizon seem limitless, waiting out this economic crisis by returning to nature seems like the best option.